Bring Back Beautiful – The Beauty of a Flower Blog candy goes to…. This is so cute, Beate! I was JUST looking at that image online last weekend 😉 May need to get her….she’s cute!! Wonderful colouring and embellishing! You always have the right balance! What a cute stamp. Need I say it is colored beautifully?! Love the way you did the blue in the background. The colors make me happyyyyyy! a big smile came to my face when I saw this card; it’s so colorful & your coloring is *perfect*; I do love Melissa Frances’s ribbon; TFS! Soooooooooooo cute Beate and your coloring is just dreamy! Hugs…. Love love love the papers, the card is adorable and fun. As always. love your colouring! 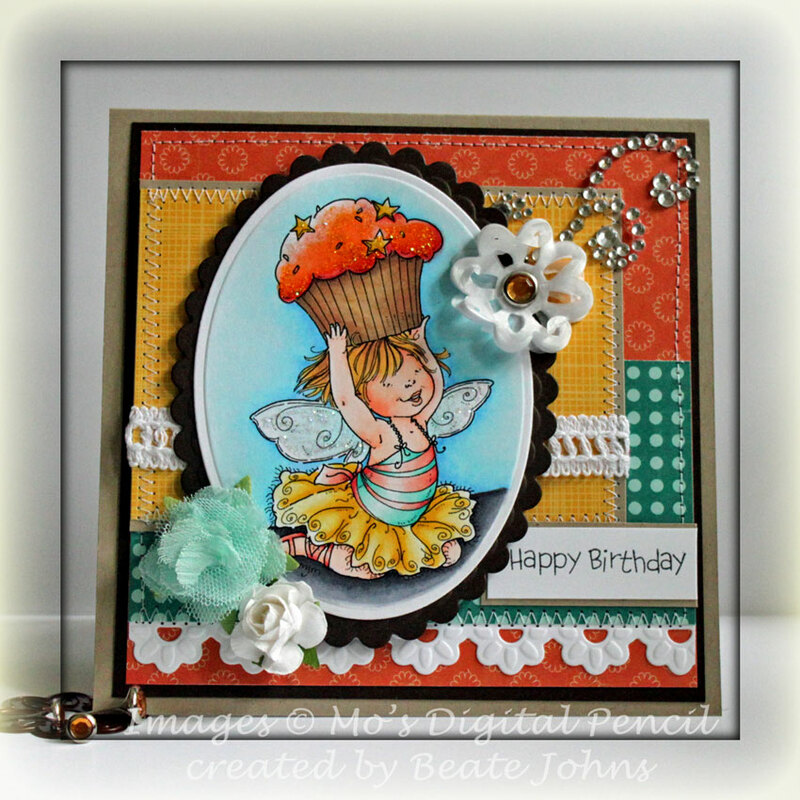 Hi Beate, Stunning card and love this Mo’s image. Terrific colour combo and gorgeous sketch. To Cute Beate. I love the patchwork look & of course your copic coloring is fabulous. Not that you probably have the time, but you really should do some copic coloring videos. I’m sure you’d get a million viewers. ;0) Thank you for sharing. Oh she’s just precious! I hadn’t seen her yet! What fun colors too, such gorgeous contrast in your coloring Beate! Oh this is wonderful – so fun and sunshiny bright!!!!! What a FABULOUS job of coloring! LOVE the icing on that cupcake, too. This is such a fun filled texture rich wonderful card! Ahhh, your coloring is so pretty Beate, truly gorgeous! Ooh, Beate, I LOVE this. That image is a must-have….at least the way you colored it – it’s adorable and so colorful. So are those papers. This is just too cute. TFS! This is wonderful! I love the vivid, warm colors you chose, and your coloring is fabulous! Awww how sweet and adorable. the card is amazing..love it..
What a sweet card, love that Mo Digital and those colors and layout are fabulous. This is so cute and colorful, Beate! I love it! Very beautiful colors and stamp. Another gem, Beate … your colouring skills are second to none, that’s for sure! Love this bright and happy card! Another amazing example of your gorgeous coloring, Beate. Gosh, that image just pops off the page. Perfect design and matching papers! Have a great day! This is absolutely adorable, Beate!! Beautiful coloring as always! Aw Beate!! This is gorgeous!! I just love your take on the sketch, the beautiful fairy and your amazing coloring!! very cute image and such great coloring of it, perfect papers to set it off too, love the border! This couldn’t be more adorable!